We don’t hear much about US residents from the far-off Pacific Islands of Micronesia. Nearly 20,000 Micronesians have moved to Hawaii, often to access health care unavailable at home. But Micronesians, although legally eligible to live and work in the US, are not eligible for Medicaid. Arriving with few resources and sometimes very ill, they find that health care services are often out of reach. A new study from the University of Hawaii documents the struggle to access care. The status of Micronesians in the US is unique. In 1986, Micronesia became independent of the US, but to retain military access to over one million square miles of the Pacific, the US signed the Compact of Free Association (COFA) with the Federated States of Micronesia and the Republic of the Marshall Islands. Palau joined the compact in 1994. 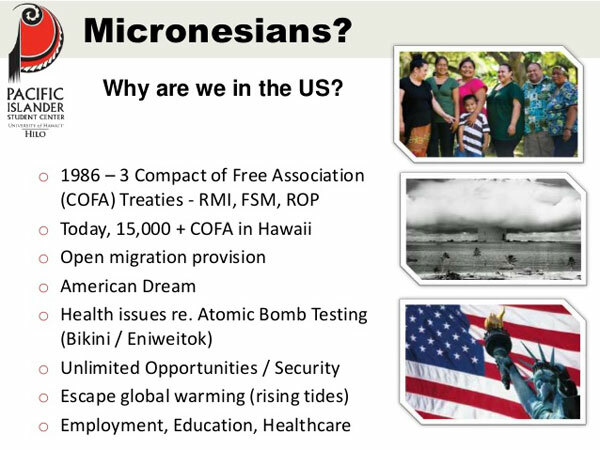 COFA allows Micronesians to live and work in the US, though they are ineligible for Green Cards and are not able to vote. Even more problematic, in 1996, under the welfare reform law passed during the Clinton administration, Micronesians were denied access to federally funded public supports, including Temporary Assistance to Needy Families (TANF) and Medicaid. The choice to deny Micronesians access to free or low-cost health care is particularly cruel. Following World War II, the US tested its new nuclear arsenal at Bikini Atoll, and evidence suggests that many of the health problems of Micronesians—especially blood and thyroid cancers—have resulted from radiation exposure. In addition, contamination of the land and water drove people to abandon traditional diets, leading to high rates of diabetes, obesity, and cardiovascular disease. Many come to Hawaii to access dialysis, which is unavailable in Micronesia. Since 1996, Micronesians have bounced around state-funded health plans, as the state tried to limit the overall budgetary costs. With the advent of the Affordable Care Act (ACA), the state required able-bodied Micronesian adults (about 7,600 individuals) to buy coverage through the ACA market exchange while it continued to provide a state-funded Medicaid plan for frail elders, children, and people with disabilities. The move saved the state of Hawaii about $29 million annually. For Micronesians, however, the health care marketplace has proved expensive and difficult to navigate. University of Hawaii research documents a reduction in health care utilization since Micronesians lost access to state-funded Medicaid. The health exchange presents multiple barriers to the Micronesian community. First, the enrollment process is complex, requiring people to first apply for state-funded Medicaid and document their rejection before applying for insurance on the exchange. Second, signing up at healthcare.gov requires a fairly sophisticated level of computer literacy; third, the site has no language translation for speakers of Micronesia’s eight indigenous languages. Finally, unlike the state-funded program, which allowed enrollment at any time, healthcare.gov has a short six-week window to apply. As a result of these impediments, the Micronesian community has a 23 percent uninsured rate as compared to four percent for the state overall. While many Micronesians are rationing their medicines and doctor visits, others are being buried in debt by health care services they need but can’t afford. Part-time English teacher Carlos Yangitelmal has been living in Hawaii since 2009. Last year, his wife died of cancer, leaving him saddled with $20,000 in medical bills for her care; he owes another $10,000 himself. Nonetheless, Yangitelmal is planning to have heart surgery soon. After that he may return to his homeland, Chuuk, where he says he’ll rely on faith to keep him well.